When a bystander is able to get a good capture of you at the Grand Palace. 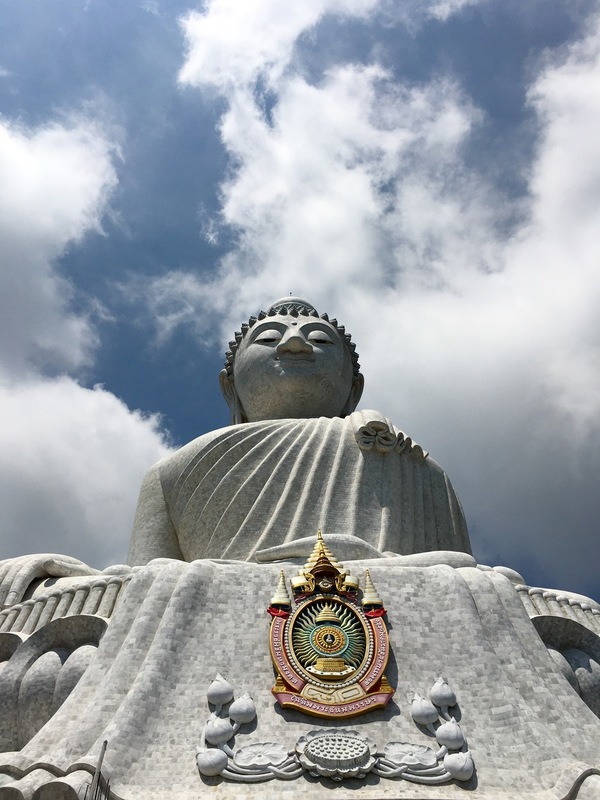 The Big Buddha that can be seen atop a mountain throughout the southern part of Phuket, Thailand. Reading while eating lunch from a street vendor. The cameraman on the opposite side of the lense, one morning in Phuket, Thailand. Reading while taking ferry to Grand Palace. Details of the Grand Palace in Bangkok, Thailand. 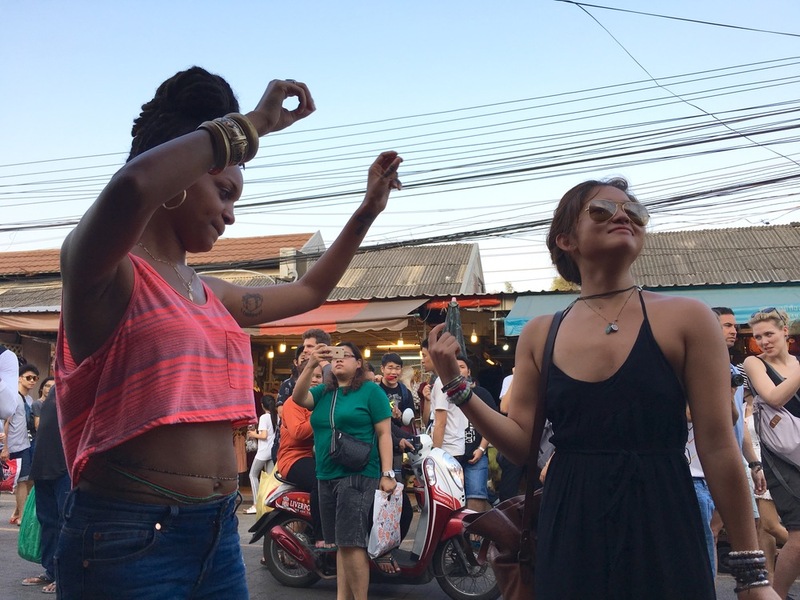 Dancing to music while enjoying lunch at the Chatuchak Weekend Market (aka JJ Market) in Bangkok, Thailand. Exploring a Bangkok river market. Heading into BKK Airport at the trip's end. Getting one of the freshest smoothies we've had thus far from a street vendor outside of JJ Market in Bangkok, Thailand. Drinking buckets of alcohol on Khao San Road in Bangkok Thailand with old friends from college. Feeding a baby elephant before doing an elephant trek. Their captivity was actually pretty saddening, and I wouldn't recommend this activity to other tourist. One of the natural beauties of James Bond Island. Touring James Bond Island from a speedboat rented just for us two. 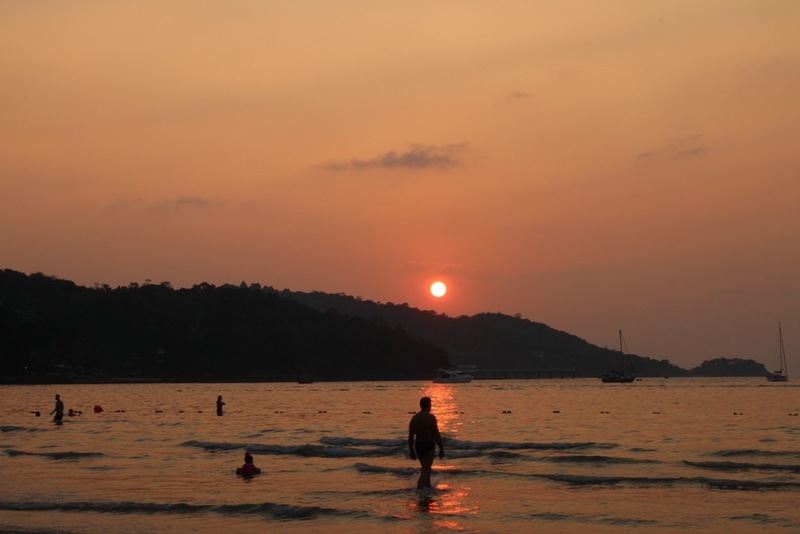 Sunset at Patong Beach of Phuket, Thailand. Examining details at the Grand Palace. 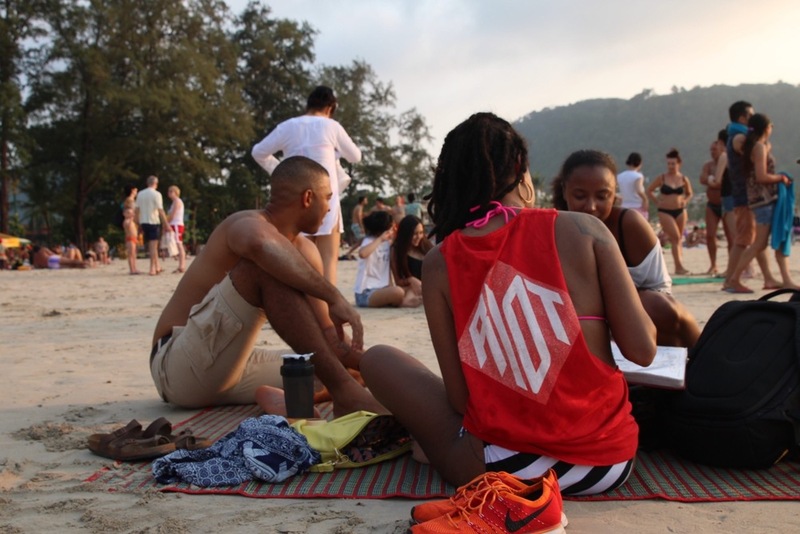 Chilling with another traveling couple on Patong Beach in Phuket, Thailand. While dealing with a crying Zora, who was back home for the first time in over a week and having trouble sleeping, it hit me: the honeymoon is over. I know that reference is usually made to explain the ending of a relationship phase. However, my relationship timeline with Chris is anything but conventional. Hence, the honeymoon phase probably began and ended long before we were actually newlyweds. No less, we spent the last week wandering through Thailand with little to no cares. At present, it was 4AM, and our reality was a stark contrast to the one we had been living abroad. You know what the beauty of that realization was? Knowing the contrast doesn't have to exist at all. The reoccurring theme of our honeymoon was creating a lifestyle not ruled by societal norms. As a Black American, it is my experience that living outside of the U.S. is seldom viewed as a realistic lifestyle choice. However, not only is living abroad sometimes a more fiscally responsible decision, it may also be more in alignment with our way of living and offer a better quality of life. Our trip was highlighted by transformative interactions with two different couples. The first couple, Amirah and Jarell, have been traveling the world for over two years - an indefinite honeymoon is the phrase they've coined for their experience. Relying solely on e-commerce generated by their personal gifts and skill set, Amirah has documented their journey on her website Cool Young History. If living stateside doesn't offer anything more than the comforts of home, at a larger expense and with less personal satisfaction, it is our responsibility to explore other options. When monetizing my skill set - it is not important to make it all inclusive, but it's necessary to appeal to those who value it most. I must learn what those who are interested in my lifestyle value about it, if I intend to monetize it. I must recognize the worth in my lifestyle and what I bring to others, intrinsically and socially. Being fair is acceptable. Cheating myself as means of not cheating someone else is not. That last quote didn't come up while we were hanging with Amirah and Jarell, but it's one that my grandmother and I frequently exchange, and it was made more clear to me during my time abroad. Seeing how A & J choose to live in a more minimal way, so they can maximize on their life experiences reminded me how certain lifestyle choices most associated with American living are limiting: having a large house, having a lot of material things to fill that house, working in corporate America (usually as means of paying off school loans given to you by a system America imposes as means of "success"), the notion that working a 9 to 5 is mandatory to thrive, etc. It's all the Matrix, and we subscribe to it. Until someone/something comes along and reminds us that we don't have to. That other ways of living not only exist, but are tangible. And possibly even more feasible than the current system you're subscribing to simply because it's the only one you've ever been exposed to. With that being said, insert couple number two of our transformative experience: Travis and Eliana. We knew this couple since our time together in college. Though Eliana and I never built much of a relationship while attending Temple University, Chris and Travis stayed in communication, and Travis photographed our maternity shoot. So, seeing some (colored) familiar faces in a country miles from home was something we were looking forward to from jump. I knew we'd try to see them, pending their schedules. What I didn't know was how impressed I'd be with their courage and intention. These two spent months researching backpacking, locations, resources, etc. They saved up their money, they quit their jobs, and bought one way tickets to Thailand in January. What I find most admirable about their choices is that though their plan wasn't at all haphazard, it also wasn't fully thought out. No less, they went with it. They did what research they could, created a hub of communication for their families and a space for documenting their journey via When In Roaming, and they did what their hearts had been longing to do. They're intentional about their spending and keeping track of their finances. They've made plans and are working on generating income abroad. They're living their lives.. not entirely carefree, because that's not entirely realistic - but they're doing what makes them happy. Never mind the family and friends that didn't approve, let alone understand. Do they have "just in case we need to make it home on moment's notice money" put aside? Surely. But in the interim, they know that a job in the U.S. is no reason to be tied down to a location that doesn't offer you any spiritual nutrition. And with all this exchange of energy.. all these free spirits, black lovers, world traveling, nay sayers be damned type of interactions... Chris and I walked away feeling reminded of something we've both said only in passing, without too much intention behind it: we don't feel compelled to remain stateside. We don't feel tied to this location or the belongings we've acquired. What we value is experiences. We most desire to show our daughter the world and the fullness thereof. So, though the honeymoon is over, the mental imprint it left behind is lingering. And we're stacking our little dollars bit by bit and devising a plan. It's not quite a master plan. Not yet, anyway. But change is inevitably coming, and we're doing our damnest to make sure we're ready when it does.